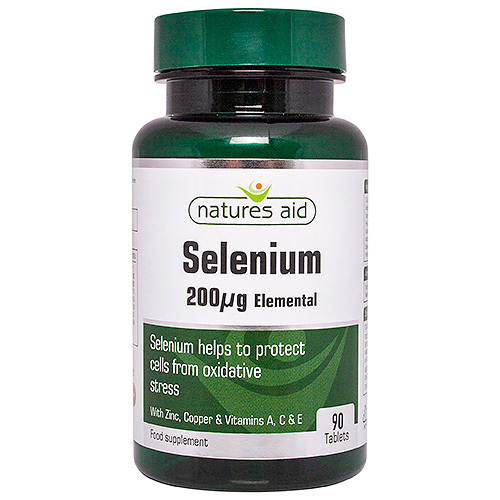 Natures Aid Selenium with Zinc & Vitamins A, C & E may help contribute to the normal function of the immune system. Selenium may help to protect cells from oxidative stress. Di-Calcium Phosphate, Microcrystalline Cellulose, Zinc Gluconate, Vitamin C (as Ascorbic Acid), hypromellose), Vitamin E (as d-Alpha Tocopheryl Acid Succinate), Beta Carotene Prep (Beta Carotene, Corn Starch, Sucrose, Porcine Gelatine, dl-Alpha Tocopherol, Sodium Ascorbate, Ascorbyl Palmitate), Anticaking Agents (Silicon Dioxide, Vegetable Source Magnesium Stearate), Copper Gluconate, Vitamin B6 (as Pyridoxine Hydrochloride), l-Selenomethionine. Below are reviews of Natures Aid Selenium & Vitamins A, C & E - 90 Tablets by bodykind customers. If you have tried this product we'd love to hear what you think so please leave a review.